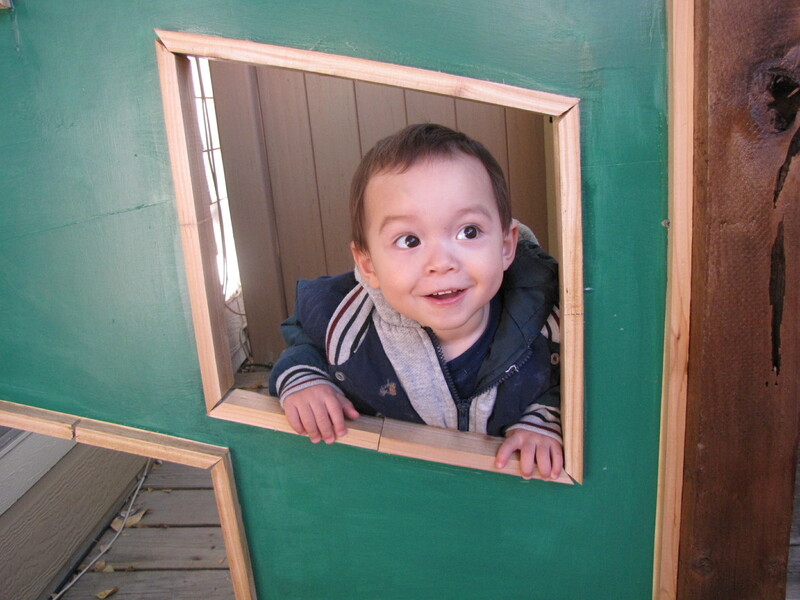 I just finished my son(s, I’m expecting another next month) Christmas gift: an outdoor playhouse. I used a router on table to create a half inch wide dado for the cedar edging. A cedar post with a deck cap from Lowes provides the stability. This project had some interesting design challenges. First, I couldn’t build something permanent, as I’m a renter, not owner. Second, I had very limited indoor and outdoor space for this project. Designing in planes, using plywood, seemed to solve the space issue. Industrial velcro attaches the sides to the townhouse itself and provides good stability. The cedar edging protects the plywood. 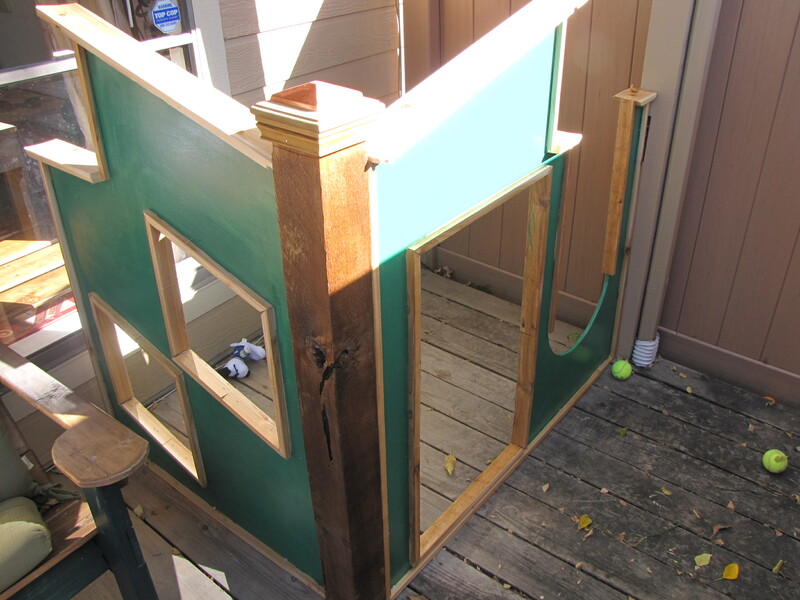 Paint and poly are reused from other projects. Cost: 140ish, Time: 9 build hrs. Installing the playhouse this morning, I thought back to a conversation I had on Friday with a co-worker about children and play. I facilitate the “Warhammer 40K Club”. Unlike many other club sponsors, I am an avid player of the game/hobby of tabletop miniature wargaming. I have been since I was a very young man and my students provide a wonderful outlet. My co-worker dropped in to see and observe, eventually striking up a conversation regarding the differing levels of “play”. One student, he pointed out, was engaged in “parallel play” – he didn’t participate in the actual game, but played with the figures and made noises to match. In fact, his maturity level wouldn’t allow him to match the complexity around him. It reminds me of my son, who loves to copy my actions, putting on work gloves I leave around, grabbing cellphones and pretending to talk, or here, looking through the window. He interacts with me, but he does play with me – he’s on a parallel track. Hence, parallel play. Another student could truly “play” in a give-and-take fashion, but he focused on the physical interactions: moving models, measuring distances and rolling dice. He needed someone to lead him in the activity. That student played the game with me, a person who understood the rules, concept and his own role in the proceedings. Another student’s fear of the group (and losing the self) led him to paint the models, while my two oldest students independently engaged themselves with the game. I won’t say they played the game – for them, their maturity allowed them to understand the rules, but struggle with the social contract that gameplay allows – think of the child who knows what fair is and means but still needs practice with sportsmanship. They had an hour to play the game, and argued about a dice roll for forty-five minutes. I stood at the highest maturity level (hard-fought) . As a grown man, I understood the rules of the game and the various social contracts involved in playing (I actually lost my game too!). To sum up, what I saw was one activity – tabletop wargaming – allowing for the various levels of maturity in my students. The youngest could join in at their comfort level, while the oldest could practice the tougher skills of social interactions. My job for the day wasn’t to teach a particular skill, but to build the playhouse (environment) and allow an exploration (the act of communal play). A wonderful time and learning conversation.